Thanks to relatively stable market conditions and low mortgage rates, some financially fortunate and savvy homebuyers may be shopping for second and third properties — and while that may be good news for both buyers and the real estate industry, the bad news is that certain types of related mortgage fraud are also on the rise. 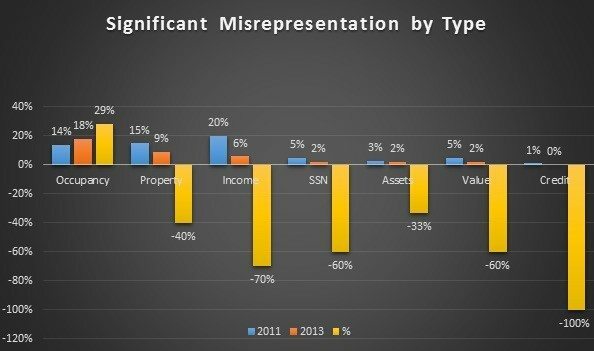 A recent report examining trends in mortgage fraud by LexisNexis says that despite tighter credit standards and a heightened regulatory environment, “It is clear that the financial environment resulting from the 2008 housing market crises remains a breeding ground for origination fraud. Although many types of mortgage fraud are actually on the decline, LexisNexis says one type is becoming more pervasive: occupancy fraud, which occurs where the borrower wishes to obtain a mortgage to acquire an investment property, but states on his loan application that he will occupy the property as his primary residence or as a second home. According to Tim Coyle, senior director of financial services at LexisNexis Risk Solutions, occupancy fraud accounted for 19 percent of all mortgage misrepresentation in Fannie Mae’s review of loan originations from 2013 — a 39 percent jump over loans originated in 2011. Because occupancy fraud is the most significant fraud category that most mortgage lenders are not positioned to defend themselves against, LexisNexis began to look closely at the numbers, pulling multiple data sets for lender clients who found themselves struggling to combat the fraud. It can also expose real estate agents and brokers to risk, he added. According to LexisNexis’ report, the mortgage application fraud and misrepresentations that are present on almost 75 percent of reported mortgage loan investigations involve industry professionals. Why do buyers do it? Financing packages tend to be better for owner-occupied homes. Most lenders define owner occupancy as living in a residence for at least a year. But despite the enticement of a good mortgage loan deal, there may be stiff penalties for anyone caught committing occupancy fraud, Coyle said. Coyle said LexisNexis is currently working on its 17th annual mortgage fraud report and plans to focus on occupancy fraud rates, including geographic areas hardest hit by the fraud. The report is due in December.